When it comes to digital marketing, traffic is everything. While many marketers believe that only a few hundred sources drive traffic to their brand’s website, research conducted using the DemandJump® Artificial Intelligence (AIM) marketing platform has shown this number to actually be in the tens of thousands. This ‘experience of tomorrow’ is driven heavily by cutting edge marketing and traffic-driving strategies, helping to realize, “Exceptional progress at Sephora which strengthened its position in all its markets and in digital,” according to Yahoo Finance. This contributed to stellar performance by LVMH as a whole, with revenues up +16% YOY in 2015. The company continually exceeds in its ability to personalize its relationship with every customer—leading the way in digital innovation, eCommerce, in-store digital initiatives, and its omnichannel approach. 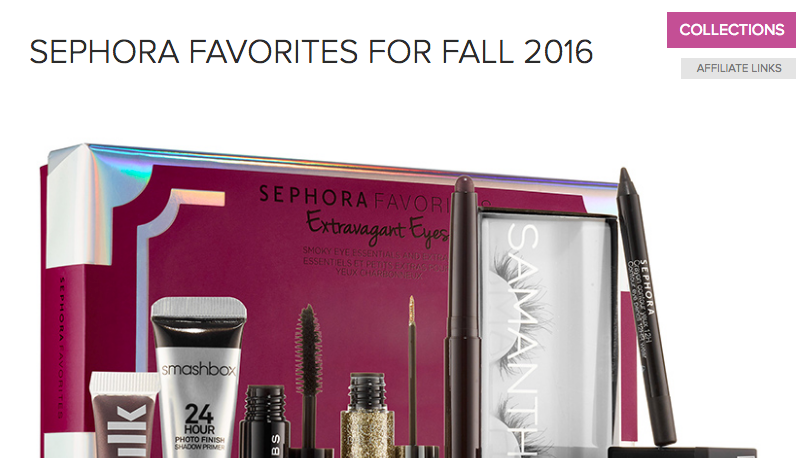 We wanted to call out three major referral sources where Sephora emerged as a clear winner last holiday season. With the 2016 holidays upon us, these insights could be valuable in developing your brand’s strategy. As a leader in driving online traffic, there is a lot that can be learned from companies like Sephora. Refinery29 is a US-based fashion, style, and beauty website. It constantly surfaces as a major traffic driver in the beauty, fashion, and lifestyle category. 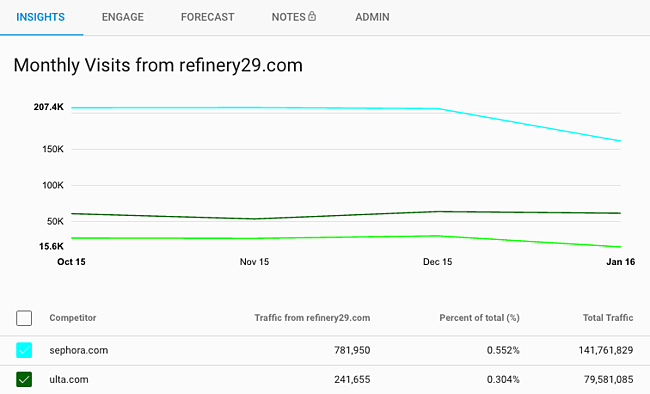 "Sephora outperforms the competition by over 223% on Refinery29..."
As you can see in the figure above, Sephora received around 200K visitors per month last holiday season. Between October 2015 and January 2016, they earned 780K visitors—500K more than ULTA who had the second most visits from Refinery29 among cosmetics competitors. One reason for this could have been Sephora’s recognition of Refinery29 as a strong source. They started early and pushed hard into December. Above is one of countless articles about Sephora that was published on Refinery29. This and more would have been responsible for driving thousands of visits to Sephora's website. Refinery29 is already directing some content towards the holidays, like the above article published on September 13th, 2016. And Sephora is all over the site once again. Sephora dominated traffic from Refinery29 last holiday season. Competitors should take note, and seek to learn something from this top rate performance last year. Temptalia is a popular beauty blogging website and reference featuring in-depth reviews, photos, swatches, tutorials, and tips. As a leading traffic driver in the beauty blog category, it is an important source for cosmetic retailers to take advantage of. Once again, Sephora was the dominant force online, driving a massive spike in November worth almost 400K visits (up around 170% from the previous month). Other competitors like ULTA and Sally Beauty earned insignificant holiday lift from Temptalia, and were, in general, outshined by Sephora. 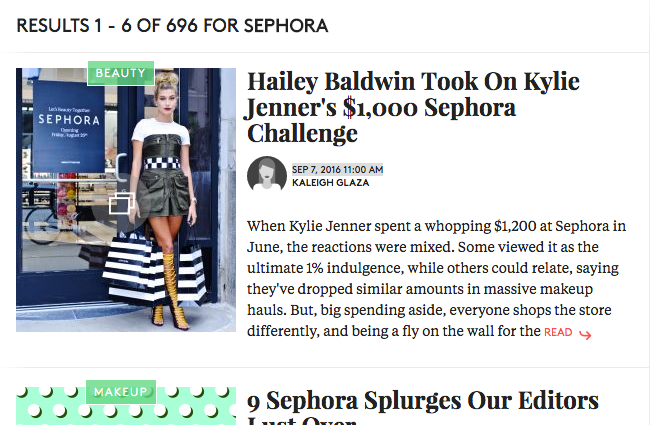 One reason for the November lift could have been early holiday campaigning by Sephora, like this article, which was posted in September of last year. A strategy executed well in advance building up to Black Friday, Cyber Monday, and the rest of the holiday shopping season made all the difference for Sephora as they earned ¾ million visits from Temptalia, with the bulk coming in November. They are active during the late summer months, with the above ad being served at the top of Temptalia’s website during the month of September. As well as several affiliate links geared towards fall 2016 shoppers. 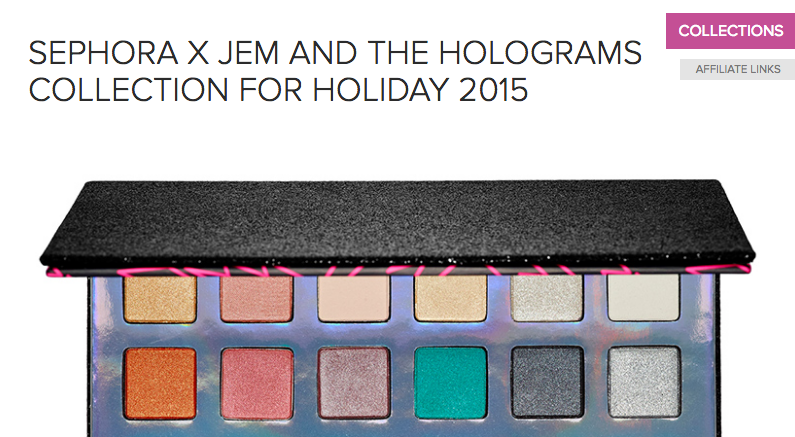 If last year’s trends continue, we can expect Sephora holiday themed content to hit Temptalia any day. There is a lot of opportunity, especially early in the season. 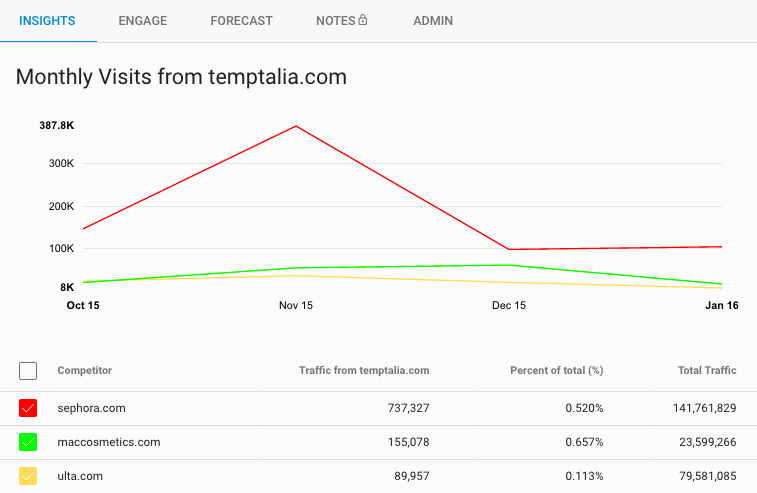 Competitive brands should be looking to leverage Temptalia for Black Friday and Cyber Monday promotions, as well as reaching out to writers and influencers to push their brand on the site. 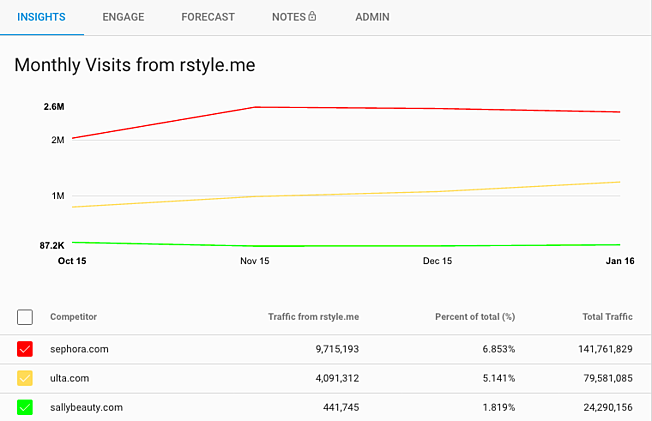 RewardStyle and their network of bloggers and influencers drove traffic to Sephora in the millions… nearly 10M visits in fact, over the course of October 2015 and January 2016. These 10M visits accounts for roughly 7% of Sephora’s total traffic over this period of time, coming in stark contrast to ULTA’s 5.1% and Sally Beauty’s 1.8%. DemandJump's predictive platform indicates that RewardStyle has untapped revenue potential for sites like Ulta and Sally Beauty, providing an opportunity for both companies to steal market share from Sephora. Modest forecasts project $10-12M worth of revenue for ULTA alone. For competitors like ULTA, Sally Beauty, Bluemercury (acquired by Macy’s in February), beautybrands.com, and more, there is opportunity to learn from Sephora and steal market share. There are millions of dollars in revenue for the taking, and a vast market thirsty for cosmetic products this holiday season. But be warned. Sephora is not slowing down, as digital innovation continues to rank as a top priority for the company. Earlier this summer they announced that followers on Snapchat could shop a variety of products directly from the app by taking a screenshot of the desired items. The first step towards stealing share of voice from Sephora is understanding the entire competitive ecosystem. Learn where they are winning and losing, and capitalize on untapped opportunities. At DemandJump® we believe every brand has a clear path the success, and the DemandJump® AIM platform shows marketers precisely where to focus their time and marketing dollars to increase qualified traffic and revenue, while increasing their market share. Top retail brands turn to DemandJump to grow revenue. Click here to schedule a custom live demo.